We have looked at friends and friendship in the last few devotions. I want to take a look at some questions regarding friends and what God wants us to do for them. 1. What is a quality we most look for in a friend? 2. What are some benefits of friendship? 3. What are some good reasons that people seek friendship? 4. How well do your friends know you? 5. How well do you know your friends? Now let’s look at some questions form our verses. 1. How would you describe the paralyzed man’s friends from this story? Why? 2. Why do you think they did what they did? 3. 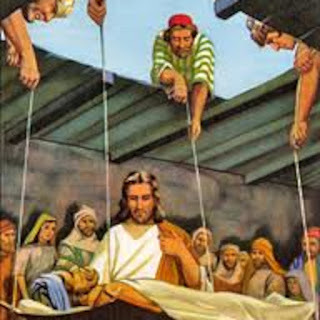 Look closely, whose faith does Jesus take note of in order to heal the paralyzed man? 4. We already know what the Pharisees and teachers of the law thought, but how do you think the other people reacted to this interruption? 5. Do you have friends like this? How do you know? 6. Do you think your friends consider you as good as the paralyzed man’s friends? Why or why not? 7. How important is Jesus within your friendships? 8. To what lengths are you willing to go to make sure your friends know Jesus? 9. What can you do to make sure all of your friends know Jesus? I don’t know about you but I know I want to have those kinds of friends around me, and I also want to be that kind of friend to others. 1. How well do you really know your friends? 2. Do they know Jesus? 4. Do you know if they have a relationship with the Lord of all lords? 5. If so, great! If not, what are you going to do about it? Here is a challenge for everyone. Take out your cell phones and get ready to send a text to a friend whose salvation you’re not sure of – maybe you know they don’t love Jesus, or you’re just not sure. Send them the following message: Hey, can we talk about something really important soon? If so, I’ll call you later. Spend some time in prayer about what you are going to do for your friends this week. Dear Lord, we pray that we would be bold this week and reach out and bring a friend to You. We pray that You would put that person upon our heart today. In the Name of Jesus, Amen.